That Nice Lady Decorator told me that, as I am now back in the embrace of the most lovely village in Provence, Valbonne, for the next two months, I should resurrect my blog occasionally. As I am nothing if not obedient when receiving orders, I am afraid you will have to put up with another missive from my good self from time to time. Since we arrived the Friday before last we have had a full and hard week of preparing the house for a terrible onslaught of visitors this summer, but I managed to persuade That Nice Lady Decorator that we should pop down into Valbonne Square for a spot of lunch as it was a Sunday, a day of rest (the Reverend Jeff has at least adopted one sensible religious idea). What I had not expected was that there was a fashion show being staged in the Square, and that some people were determined to make their own fashion statement whilst watching the various models, often in a state of undress, strut their stuff to the, frankly, dribbling masses. At my age, dribbling is about all I can manage (and nowadays I find that quite rewarding), but even I, an often daring pioneer when it comes to sartorial matters, would never resort to making a fashion statement as extreme as that which I captured on my phone during proceedings. I wonder if he cut out some eye holes? For me as a dedicated salesman for the services of FC Exchange, when planning to attend a fashion show, even I, with what some might say is my distinct record of failure in the fashion stakes, would think twice about using a cardboard box for protection from the sun, but it seems from the picture I took that there are people even more daring than I . My message today is that there are still people out there who are able to express themselves sartorially in ways that I will never understand. 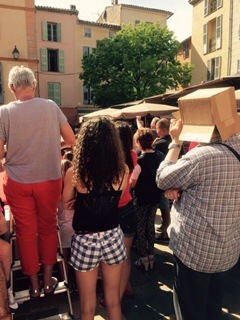 One might be expected to think that if one was expecting to be present at such an open air fashion show in the sunshine with temperatures in the mid 20’s Celsius, one might consider some sort of cranial protection. A hat perhaps?, a parasol?, even a cap? Where on earth came the inspiration to a cardboard box as a sunshade? So yes, I am once again in the bosom of France, enjoying that sunshine and temperatures in the mid 20’s centigrade whilst my old pal Peachy Butterfield is enjoying temperatures in the mid 20’s Fahrenheit. (He is marooned in Cheshire for a week examining the gradual softening of the tundra.). Now I am here for the next two months, and will be celebrating not only my return to France, but later in the summer, a significant birthday for That Nice Lady Decorator. I have never been a fan of Dr Who but the concept of time travel does appeal to me. It seems that the Decorating Operative has somehow entered a time warp because when we were first married, there was a merely a few short years between us, but now it seems that the Nice Lady Decorator has remained at the age of 37 whilst I have accelerated into my seventh decade, which in some circumstances might suggest that I may be a candidate for the Child Protection Register. Anyway, said milestone, (37 for the 23rd time) is going to coincide with a big influx of pale, grateful and rather thirsty chaps from England and other sun tan avoidance countries into the south of France, and yours truly has been handed the organisation of celebrations for the travelling rabble. If I told you that I already have two spreadsheets for the events, you may understand the burgeoning logistics of such an undertaking. However, it is all supposed to be a surprise, so mums the word. Welcome back, mate you have been sorely missed.